Yes, I know I'm behind in posting my photos, but my goal is to post all of my 2008 photos before the year is finished. In either case, here's some photos from the Yahoo! SearchMonkey launch party back in May. This is the first launch party that I've attended where it featured a project that I was working on. Enjoy the photos, and I also have included an accompany sound track if you'd like. (I was too lazy to build my own Flash slideshow with music). For more information, you can check out the Yahoo Search Blog entry entitled, "The Party May Be Over, But the Monkeying Has Just Begun", and as a bonus, they have a photo of me on there as well. For the geeks, you can check out http://developer.yahoo.com/searchmonkey/. Just a short blog post today. Sorry, I've been slacking off because it's Thanksgiving here, but there has been a lot of remarkable news. In particular, the terrorist attacks in India. What's remarkable is that a journalist has captured the photo of one of the terrorists as seen here. The journalist was holed up in a train station, with three of the attackers there. Apparently the police were unwilling to engage the terrorists. Remarkable. 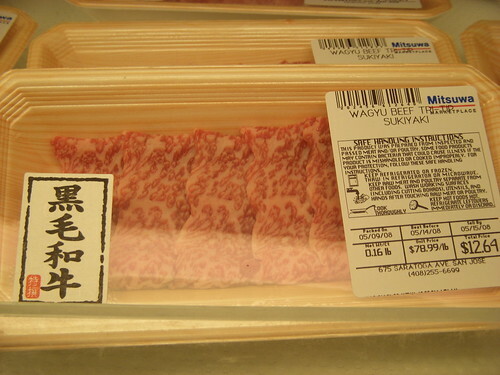 A while back, I was explaining a Japanese supermarket, and I came across Wagyu Beef which sells for $78.99 a pound. This is likely the most expensive beef I have ever seen in my life. This beef is crazy expensive because of the incredible marbling that the meat has (ie meat to fat ratio), and marbling == flavour. Wagyu refers to several breeds of cattle genetically predisposed to intense marbling and to producing a high percentage of oleaginous unsaturated fat. The meat from wagyu cattle is known worldwide for its marbling characteristics, increased eating quality through a naturally enhanced flavor, tenderness and juiciness, and thus a high market value. Several areas in Japan are famous for the quality of their Wagyu cattle, and ship beef bearing their areas' names. Some examples are Kobe, Mishima and Ohmi beef. The wagyu cattle's genetic predisposition yields a beef that contains a higher percentage of omega-3 and omega-6 fatty acids than typical beef. The increased marbling also improves the ratio of monounsaturated fats to saturated fats. This was all over the news today, a meteorite entered the atmosphere over Albertan airspace, and the video footage is amazing. The entire night sky is lit up by the meteorite. Just a heads up, I just booked my flight tickets for Christmas vacation, and I'll be back in Victoria by December 19th, and I'll be sticking around for about a month. I'm staying a bit longer this time around because once I get back to America, I won't be able to leave the country for a while (work visa stuff), so I'm making this visit count. I'm now officially opening registrations for lunch, dinner, and/or coffee with me. Anyways, it'll be nice to get back to experience a real winter. California is freakishly warm right now, yesterday was 27C. It's hard to get into the Christmas mood when it's like summer out. For the speculators, no I am not returning to Victoria for good yet, as victory conditions have not been met yet. We'll have to see how 2009 goes. War planning is in progress for 2009. Forty-two is how many minutes I spent dealing with technical support today, which is probably forty minutes too long. It all started when my internet connection decided to die three days ago, and it never came back to life. Clearly, there was something wrong with the actual internet wiring, and not some user error on my end. So, before I called tech support, I already knew the root of the problem, and I needed them to send a technician to take a look. I call up my internet provider today to get my line fixed, and I'm greeted by a glorified voice mail system. The system reads out a bunch of menu items, and I work my way through the hoops. What was annoying was that some the system asks me to actually say out loud some of my options, and the computer has troubles recognizing what I'm actually saying. Five minutes after jumping through automated hoops, I'm routed to a guy named John in India. John starts with pleasantries and annoying chit chat like how I am doing. Privately, I wanted my internet connection fixed instead of wasting time talking about the weather. He goes through his script and asks what my problem is, what my account number is, etc. This is annoying because I already provided all this information in the automated voice message system before talking to John. I tell him exactly what is wrong, but he insists on going through normal troubleshooting procedure. I play along even though I know a lot of his questions he's asking is not even remotely close to what's wrong. He exhausts all of his questions and transfers me to level 2 tech support. Huzzah, I leveled up. I'm then routed to a guy named Adam who's based in the US. He asks the same basic questions again, like how many lights do you see on your modem. I insist on telling him, the INTERNET LIGHT IS BLINKING RED, I'M SEEING 100% PACKET LOSS there's something wrong with the line. He gets me to repeat newbie steps like unplugging the modem, and all that stuff. We go through more troubleshooting. Finally he decided to run a line test, and discovers that the internet signal is not even reaching my modem. There appears to be something wrong with the physical connection. We're going to have to promote you to level 3 tech support. Rinse and repeat, and they conclude that they have to send a technician over to check the internet lines, which is what I told them initially. I was on the phone for 42 minutes before they would dispatch a technician. I really wish there was a way for people with legitimate computer backgrounds, who know what they're doing, to enter a secret code or something when calling tech support. That code would tell tech support that the customer knows what they're talking about, so skip all the newbie troubleshooting questions, and go straight to solving the problem they present. Tech Support: Hello Mr. Chan, your access code has been authenticated, and we see that you're someone skilled with computers, how can I help you? Chan: Hi, my internet connection has been down for days, and there's something wrong with the physical line as I'm seeing 100% packet loss. Please send a technician to repair the line. Tech Support: Alright Mr. Chan, we'll have someone over as soon as possible. Have I resolved the issue you were calling about? With Remembrance Day upon us, I was reading this article in the National Post entitled, "Canada never one to back away from war." We are not a country that seeks out war. Indeed, we have always let our military deteriorate between conflicts, focusing our public spending instead on domestic priorities. There was almost as much expert and media hand-wringing over the sad state of our Armed Forces between the First and Second World Wars as there was immediately before the recent round of spending by the Conservative government. Yet when called upon, we are always equal to the challenge with our combination of full-time soldiers, reservists and volunteers. Whether ensuring the first election in a nascent democracy goes off fairly, rushing aid and medical personnel into a disaster zone or engaging in old-fashioned combat, Canadian soldiers, sailors and airmen have long established that they are even-handed in policing trouble spots and tenacious fighters where someone else has started the battle. For too long, our politicians, academics and educators have tried to bury or even deny our true military history, insisting we have never been a warrior nation. And while it is true that we have never as a culture glorified war, neither have we backed away. Yes, Canada has been instrumental in developing the modern concept of peacekeeping, something of which we should be extremely proud. In Kashmir, Suez, Congo, Cyprus, Somalia, Haiti, Rwanda, Bosnia, Lebanon, Cambodia, Angola, Mozambique and dozens of other conflicts around the globe, we have over and over again proven ourselves equal to the complex and dangerous task of standing between two warring factions (or more) and keeping them from killing one another. And we have lost over 100 brave young men and women in 50 years of this service to mankind. Still, we risk dishonouring those Canadians who have gone to war to defend our nation and its values when we seek to revise our history and downplay our contributions to wars fought in the name of freedom. This is especially true at a time when more than 2,500 of our soldiers are battling the Taliban and al-Qaeda on the plains and in the mountains of Afghanistan. Nearly 100 have lost their lives there in the past six years trying to bring stability to the people of that nation and deny terrorists a staging base from which to plot their attacks on the West. I think it's interesting that the author points out that Canada does not glorify war, but we don't back away from it either. In my time in the US, I have noticed that people here are a bit too rah rah about their military. To illustrate the difference, when was the last time you watched a war movie featuring Canadians in a war conflict? Off the top of my head, I can only think of Hotel Rwanda where it highlights Canadian General Dallaire, and the Canadian involvement isn't really the main part of the story. American war movies, I can list off quite a few: Pearl Harbor, Saving Private Ryan, Black Hawk Down, Band of Brothers, Patton, etc. In either case, I do prefer the Canadian approach to war making; we don't actively seek out war, but we will bring it if needed. Remembrance Day used to be kind of abstract to me because I couldn't really internalize what it meant when someone talked about the sacrifices that soldiers make for their country. It only hit home a couple years ago when the headlines said that the US military was stretched really thin, and some politicians were pitching the idea of a draft. A draft usually involves recruiting able bodied citizens, which largely consists of my demographic. I pondered the hypothetical situation of the things that one would have to give up should a draft actually be implemented. In my case, that would mean not being able to finish my schooling. It would mean being posted to anywhere in the world without my say. It would mean putting aspirations to go after that dream job on hold. It would mean not being able to spend time with that special someone as I could be thousands of miles away. It would mean wondering every day if this was my last day on earth. With that in mind, I am grateful to those who volunteer to fight our wars, so that the rest of us can enjoy our freedoms as civilians. I end by applauding all those who have served their country to preserve our freedoms, our national interests, and our sovereignty. "I'm too lazy to fail."